Animals are a part of life in the village. We included animals in our plans for the mission because they can provide protein in the villagers’ plant-based diets. Animals can also reproduce and provide their owners with continued dietary benefit or they can be sold for much needed income. But these villagers are extremely poor and many do not have animals. Our animal projects began with the barter of six chickens in exchange for some clothing. Those six chickens were allowed to sit their nests and they have provided a large increase in size of the flock. This allows for us to provide eggs to others. 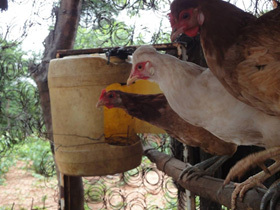 It also allows us to be able to give a couple of chickens to widows who can then begin their own flock. You could not contain the excitement when our first baby goat was born. Women walked from all over the district to welcome that baby. It was followed two weeks later by the birth of twins. We were off to a good start. We have a co-op of women who are raising goats. Several goats were gifted to the women in the Bible study group. 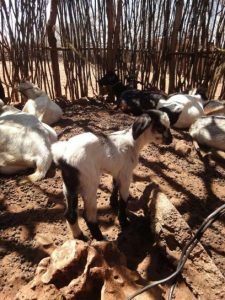 After discussion, it was decided that rather than slaughtering the goats and dividing the meat, which would feed them for a meal or two, these goats would be the beginning of a herd that would be bred. The ladies agreed to work together to feed and water and care for the goats. 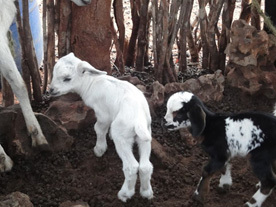 As new goats are born, they will be added to the flock. When the flock reaches sufficient size, the members of the co-op will be given goats to take home so they can start their own flocks. This year, the project has had a setback with several miscarriages. A local vet has agreed to work with the women to help them learn how to administer the needed medicine. This is not a short term project and the rewards will not be available for a couple of years. But by working together, they can provide for a better future for all members of the co-op. Another long-term project that has begun is the raising of pigs. A large meat company in Zimbabwe is willing to buy pigs but will only work with someone who has a large number of pigs for sale. No one in the village can do this by themselves. But by joining together, the village can provide the number of pigs needed. Any villager who wants to participate can be a part of the group. Pillar of Legacy bought several pigs including several males, who are now of breeding age. It is our hope that this project once it has been established will provide a steady source of income to the village families. Raising animals does require some extra effort in Zimbabwe. Instead of just fencing an area as we might in other parts of the world, here the pens must also have a covering over the top of the area to prevent attacks by lions and other predators. It has been an interesting education to our missionaries, seeing what is involved in these endeavors.